The Philadelphia Federal Reserve Bank released new data today on State Coincident Indexes (and a national index), which are composite index measures based on four individual variables that summarize the current economic conditions in each state in a single statistic. The four state-level variables in each coincident index are: a) nonfarm payroll employment, b) average hours worked in manufacturing, c) the unemployment rate, and d) inflation-adjusted wage and salary disbursements. 1. Over the last three months, North Dakota led the country with the highest coincident index increase of 1.62%, followed by Ohio at 1.46% and California at 1.12%. The national coincident index increased by 0.57% during the May-July period. 2. Over the last six months, North Dakota's increase of 4.29% in its state coincident index was the highest in the country, followed again by Ohio at 2.92% and then by Massachusetts at 2.61%. The increase in the national index from February to July was 1.28%. 3. Over the last year, North Dakota's coincident index improvement of 10.85% was by far the best in the country, followed by Ohio at 5.81% and Michigan at 4.97%. The national coincident index improved by 2.71% from July 2011 to July 2012. 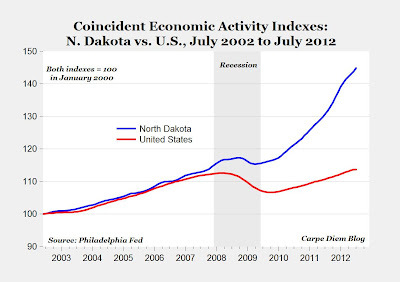 See chart above of coincident indexes for North Dakota and the U.S. over the last ten years. 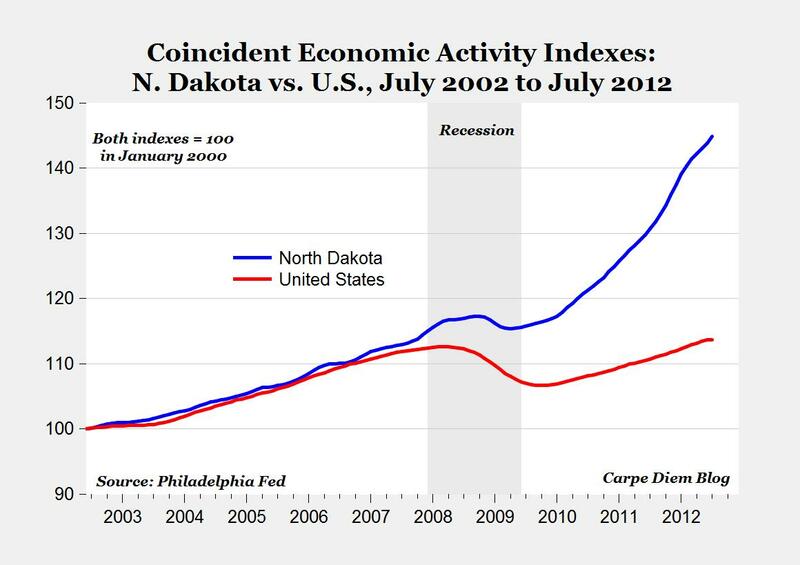 MP: Once again, North Dakota leads the country on another economic indicator, along with leading the country with the lowest state jobless rate, and the highest rates of growth for employment, personal income and state product, among others. The 0.57% quarterly improvement in the national coincident index from May to July and the 2.71% annual increase in the U.S. index since last July provide additional evidence that the U.S. economy continues to expand at a moderate pace. For the last six months starting in February, the national coincident index has been above the index level in December 2007 when the recession started. Next to North Dakota, Ohio's state coincident index has shown the greatest improvement over the last quarter, the last six months and the last year. The recent increase in economic activity in Ohio is very likely related to a rebound in the state's manufacturing sector (28,000 new factory jobs since last July with strong gains in the state's steel industry), increased natural gas activity in the eastern part of the state, including the Appalachian region, and increases in the state's crude oil output. Ohio's energy-related economic expansion demonstrates that North Dakota's energy prosperity can be duplicated in other states that pursue pro-energy, business-friendly environments. so why are WVA, MI, & AK lagging? West Virginia is Coal, AK is oil (feds have been preventing drilling) and seafood. Not too sure on MI. Michigan --> Detroit --> General Motors. Nah, GM doesn't have that much power in MI.